The Advanced Camp for Soccer referees will again be held in conjunction with the Bluegrass State Games. We will be taking applications for this camp beginning today. Camp is scheduled for July 24 & 25 and will cost $55 (officials will be compensated for each match officiated by the BGSG). As in the past, participants will be housed in a dorm on the UK campus (at no cost) through the BGSG organization. 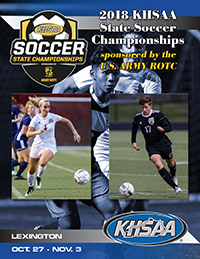 For information on the camp, visit our Soccer page on the KHSAA website, where you will find the information for the KHSAA Referee camp (Soccer Referee Camp Information). You must also work a few of the Bluegrass Games as a part of this camp. To do that, you will need to register with them. The link for information can be found on our website at Bluegrass State Games Registration Information. If you have any further questions, please feel free to contact Chad Collins here at the office via email (ccollins@khsaa.org) or phone (859-299-5472) or contact me at mbarren@khsaa.org. Either of us can assist you with the camp. We look forward to seeing you at camp!